During the last forty years, fast food giants - McDonalds, Burger King, etal. - have led a revolution against traditional eating habits. These huge corporations not only roll our meals off assembly lines, but control all aspects of their multi-billion dollar industry: the breeding of cattle, preparation of hamburger patties, employee interactions with customers, even the amount of income franchise owners must spend on advertising. But an examination of this ultra efficient approach reveals troubling methods: steroid fattened beef, questionable advertising and public relations campaigns, the tremendous emphasis on increasing profit. Hamburger cattle often consume more protein in a year than entire Asian or African families. Meanwhile, MACPROFIT suggests, the fast food industry is not so much serving our nutritional needs as practicing mind control. Note: See also HAMBURGER: JUNGLEBURGER, Peter Heller's companion film to MACPROFIT. 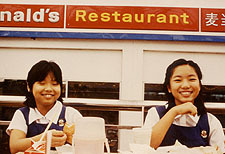 Examines the impact of the fast food industry on Third World countries.